When you think about installing new floors in your home does vinyl flooring ever come to mind? Well it should because vinyl flooring is widely regarded as one of the best types of floors on the market and has become quite popular amongst homeowners over the past couple of decades. So what exactly is vinyl flooring? Vinyl flooring comes mainly in tile form and ranges in thickness depending on the consumer’s personal preference. It is a popular type of flooring that is commonly used in bathrooms, kitchens, and utility/storage rooms in many households and businesses. 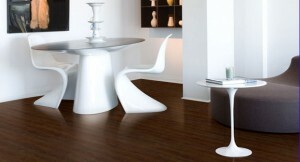 Another reason that makes vinyl so popular is its distinctive feature of being able to imitate other types of flooring. It is often mistaken for hardwood, concrete, stone, and tile flooring. They do say imitation is the sincerest form of flattery, and Carpet Corner believes vinyl is the very best at it. Vinyl flooring is used regularly because it is known to be water and stain resistant, and it is more affordable than other types of flooring such as wood and carpet. It is easy to clean and maintain and comes in a variety of different colors and designs. It has also been regarded as a more durable and comfortable type of floor as compared to other types like wood and laminate. Its sponge-like material makes it harder for delicate materials like glass to break if they are dropped on it. Vinyl flooring is also known for being one of the quickest and easiest types of floors to install. Carpet Corner provides vinyl flooring from reliable, top brands such as Shaw, Mohawk, Bliss, and Armstrong. We offer free flooring estimates and professional installation at your convenience. We work close with our customers to make sure they pick the vinyl style that suits them best and one they will be happy with for years to come.